by Peter Menconi. Mt. Sage Publishing, 2010. What began as a pastor’s two-part sermon series on how six generations relate to each other, led to this book that examines five generations from 1906-2000. Menconi believes that today’s congregations can survive and thrive if all generations understand each other’s contexts. The premise of Part 1 “Intergenerational Realities” is that a church’s overall effectiveness in all of its ministries will be determined by its ability to engage all generations present. Part 2 “Understanding Today’s Generations” explores the social and historical contexts that have shaped the GI, Silent, Boomer, Generation X, and Millennial generations. Part 3 “Toward an Intergenerational Church” acknowledges the tensions that exist among the generations and their differing views concerning what the mission of the church should be. 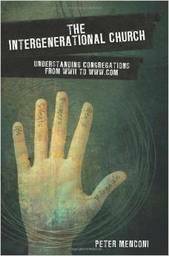 It outlines very practical suggestions for integrating the generations in all aspects of church life. Helpful worksheets are included at the end to stimulate dialogue.